Two individuals clutch each other on top of a sculpture. They are both veiled, donning delicate lace. Is the embrace is holding each other up, are they kissing or are they simply sharing an intimate moment atop this uber masculine sculpture of a bull? The original name of the channel that separates the two sides of Istanbul, the Bosphorus Strait, means cattle crossing, or cattle passage. This refers to a Greek myth in which Io was turned into a cow and condemned to wander the earth until she crossed the Bosphorus. Here, she met Prometheus. He sympathized with her and reassured her that Zeus would eventually make her human again. 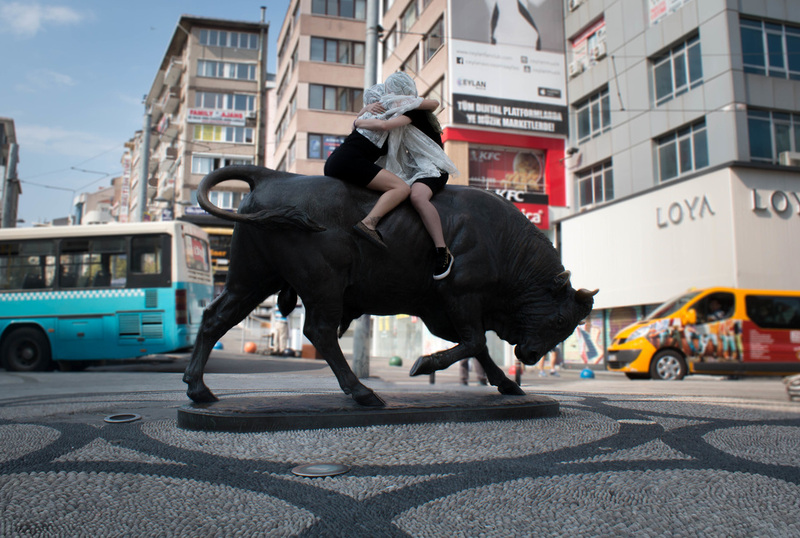 The unofficial symbol of Kadikoy is the bull. People use this sculpture as a meeting point, a distance marker, and as an opportunity to take a “selfie”. The bull is a multilayered symbol, used by hundreds of different cultures and religions at various times in history. It represents physical strength, power, the inability of humans to tame “beasts”, a positive market. Like it’s female counterpart, the cow, the bull is fertile and therefore was often subjected to ritual sacrifice.. We’re presented with violence as a method for conquering the bull, as exhibited in bullfighting. Do we have sympathy for the bull, for the animal that is burdened with this great symbolism, upon which humans placed this meaning? The bull is an animal in American herds more likely to be slaughtered if it isn’t a perfect specimen. This “bull” is obviously not an actual bull, but a man-made representation. Yet this reproduction of a physical animal epitomizes the extent to which we have shaped the bull as a symbol of something else, rather than the animal itself. I call upon the feminist ethics of care to address these questions. Ecofeminist philosopher, Val Plumwood deems care, compassion, and emotionality as necessary components to grant agency to nature and to acknowledge it as a fully active participant in what it means to be human. We shape nature and nature shapes us. Does it diminish the agency of animals to burden them with human symbolism? Countering the Bull from Ruth K. Burke on Vimeo.